Closed: Sundays, and Wednesday/Thursday for lunch. Directions: From Siena, take the Chiantigiana; as you get in to Castellina look for signs for the restaurant on your left, and via Fiorentina. North of Siena, just outside of Castellina in Chianti, is the Michelin star award-winning restaurant Albergaccio owned by Francesco Cacciatori and the chef, Sonia Visman. Opened in 1989, Albergaccio is an elegantly restored farmhouse with beautiful views and a quaint interior. It has an expansive wine list of 313 labels, with many of the wines representing good values as well as rare finds. The food is creative and beautifully presented with service that is friendly and professional. The owner, Francesco, is a fixture in the dining room and will help you navigate the menu and excellent wine list. I first dined at Albergaccio with my father, an enjoyable respite from a cold day. Whether it was the rustic charm of a blazing fire during the winter or the bucolic views, the restaurant offered an idyllic setting. There is also an expansive terrace during the summer for dining alfresco. While the atmosphere is lovely, it is eclipsed by the quality of the food. The following recipe is a delicious and creative take on pumpkin soup that intrigued me. The crispy polenta croutons set off the sweet and creamy goodness of the soup—a beautiful combination. Add the olive oil to a deep saucepan, and cook the onion on low-medium heat until soft and translucent, approximately 8–10 minutes. Add the potatoes and the pumpkin, and cook together with the onion for about 5 minutes, then cover with the vegetable stock. Add the sugar and the basil leaves. Cover and simmer for about 1 hour on low heat. Stir periodically. After one hour, add the butter and whisk everything until you obtain a smooth and delicious creamy soup. Add salt and pepper to taste. Serve with croutons. Boil a pot of water. At the boiling point, add the salt and then the corn meal, continually stirring to prevent it from sticking or burning. Stir the polenta continuously until very thick, about 20 minutes, although time varies depending on the corn meal used (you may add some additional water if it thickens very quickly). Coat a glass ovenproof dish (7” x 11”x 1-1/2”) with the butter. When the polenta is ready, pour the polenta into the dish and spread so it is no more than 1/3 of an inch deep and let it cool for several hours (after it reaches room temperature place pan in the fridge). Slice the polenta in strips, and then into small cubes, Dust them in flour and deep-fry them in peanut oil (use a deep pot with at least an inch of oil). Cook for 8 minutes or until polenta has browned and become crispy. 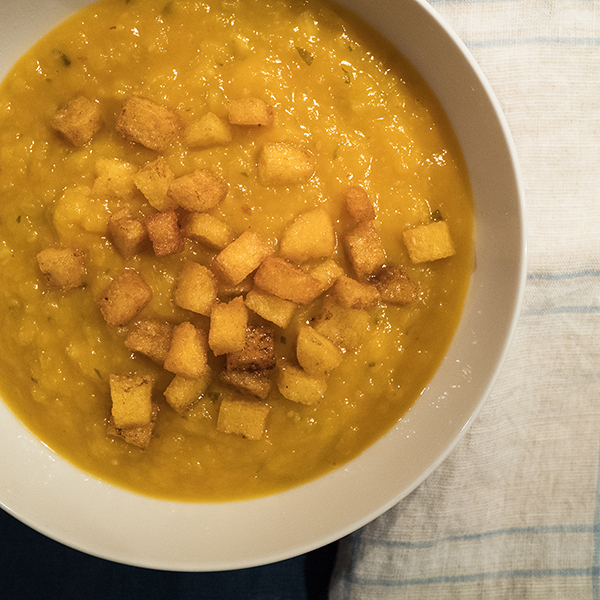 Add the warm, fried corn polenta cubes to the creamy pumpkin soup, and enjoy! Author’s Note: Pumpkin is available only in the fall, but this soup is delicious much of the year. Try substituting butternut squash, which is available for longer periods, and prepare the same way. If you are looking for an appropriate wine, this dish pairs particularly well with an off-dry Gewurtraminer or Riesling from France or Austria.